11:46PM EST November 5. 2012 – Seventeen months have passed since the Department of Homeland Security announced it would create an internal civil rights review of the Obama administration’s signature immigration enforcement program, but now department officials cannot say when, or if, they will complete it. Immigration and Customs Enforcement (ICE) Director John Morton announced in June 2011 that his agency would create a statistical monitoring tool to ensure that law enforcement agencies were not using the Secure Communities program to engage in racial profiling. 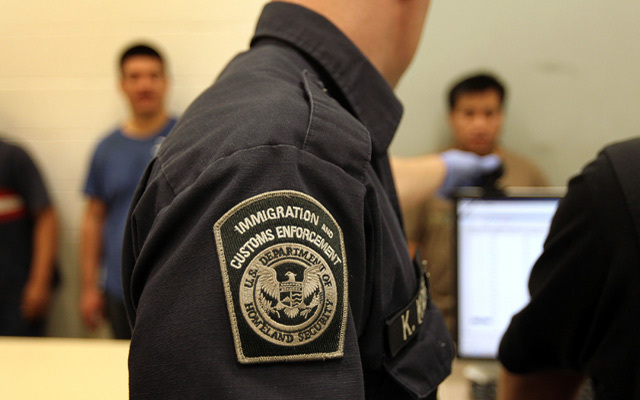 The program screens all people booked into local jails for federal immigration violations. Despite calls from a Homeland Security task force and outside groups to complete the review, officials are not sure when that will be possible. “Certain data collection factors have created challenges, delaying the completion of this model,” Homeland Security spokesman Matt Chandler said. He said they are working “diligently” to find an effective way to monitor for civil rights abuses. People booked into jails have their fingerprints sent to the FBI to check their criminal background. Under the Secure Communities program, those fingerprints are then sent to Homeland Security to check for immigration violations. People who are flagged are then examined by ICE and could be deported. The program, created in 2008 under President George W. Bush and embraced by the Obama administration, has expanded rapidly. It is now active in 97% of local law enforcement agencies with the goal of 100% participation by 2013. Several reports have found considerable flaws in the program. An October 2011 study by researchers at the University of California-Berkeley that examined a random sampling of people arrested under Secure Communities found that about 3,600 U.S. citizens had been erroneously arrested by ICE. The report also concluded that Hispanics were disproportionally targeted through Secure Communities — 93% of people arrested were Hispanics, even though they make up 77% of the illegal immigrant population. Another review in September 2011 by a Homeland Security advisory council raised similar concerns. Half of the 14-member review panel said the program was so flawed it should be suspended until it could be fixed. “Task Force members believe that it makes little sense to expand a program that many community leaders and elected officials consider deeply flawed, especially as to its impact on community policing and civil rights,” the report found. Since then, officials in various jurisdictions in the U.S. have pushed back against the program. The California Legislature passed the TRUST Act, which would have limited the state’s cooperation with Secure Communities, but Gov. Jerry Brown vetoed it Sept. 30. This entry was posted in Press Coverage on November 7, 2012 by Ian.